third time's a charm , huh? wouldn't be good to update their band photo as well? Not that i don't like this one but you know just for a change.After all Simon has got long hair now,no more The Clash style. Reeves Gabrels tweeted the same thing. I'm so glad that the 2016 tour will not be the last one. And that probably means we'll get a Greatest Hits set ...with hopefully some new stuff...? I'm wondering whether Robert's tweet was a down to festivals announcing the dates before the band had a chance? Do you think he's had enough of it? I'd be pretty miffed. Yeah I just saved a lot of money for next year because I despise festivals. Even when I was able to physically stand them I still hated them. But I think Festivals for them are Cheaper, less hassle, they hope to acquire more fans, and they make more money. Sh!t for us great for them. We can't complain really. They gave us a fabulous proper tour in 2016 at the risk of Robert losing his voice forever. And this is not an uncommon pattern for them. They often have a festival year after or around a regular tour. Let them enjoy. 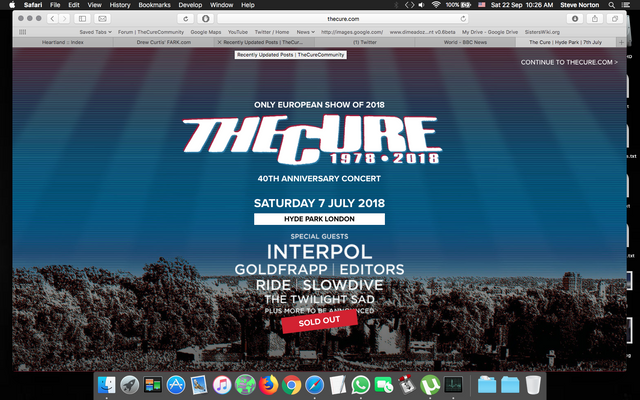 I think my biggest bug bear about festivals is that usually you have to buy tickets for the whole event & suffer a dozen crappy bands before The Cure step out. Most festivals don't do day passes until quite close to the time. On a brighter note - Hyde Park isn't the only one they've curated the lineup for. A Disintegration festival tour with appropiate line up could be great! Yeah I just saved a lot of money for next year because I despise festivals. Even when I was able to physically stand them I still hated them. But I think Festivals for them are Cheaper, less hassle, they hope to acquire more fans, and they make more money. Sh!t for us great for them.